What makes flying fun? How about funny airline announcements? Pre-flight and routine updates while airborne and when landing are part of the package. Isn't it great when those airline announcements are punctuated with levity and a bit of fun! "Welcome aboard! To operate your seat belt, insert the metal tab into the buckle, and pull tight. It works just like every other seat belt, and if you don't know how to operate one, you probably shouldn't be out in public unsupervised. In the event of a sudden loss of cabin pressure, oxygen masks will descend from the ceiling. Stop screaming, grab the mask, and pull it over your face. If you have a small child traveling with you, secure your mask before assisting with theirs. If you are traveling with two small children, decide now which one you love more." "There may be 50 ways to leave your lover, but there are only 4 was out of this airplane." "Your seat cushions can be used for flotation and in the event of a water landing, please take them with our compliments." "Folks, we have reached our cruising altitude now, so I am going to switch the seat belt sign off. Feel free to move about as you wish, but please stay inside the plane until we land . . . it's a bit cold outside, and if you walk on the wings it affects the flight pattern." "Weather at our destination is 50 degrees with some broken clouds, but they'll try to have them fixed before we arrive. Thank you, and remember, nobody loves you or your money more than we do!" "As you exit the plane, please make sure to gather all you belongings. Anything left behind will be distributed evenly among the crew. Please do not leave children or spouses." "And should there be an unexpected loss of cabin pressure, oxygen masks will drop from the panel above you. If you are traveling with a small child, attach your mask securely first, then assist your child. If you are traveling with two small children, decide which one you love most." "We'd like to thank you folks for flying with us today. And, the next time you get an insane urge to go blasting through the skies in a pressurized metal tube, we hope you'll think of us." "Weather at our destination is 50 degrees with some broken clouds, but we'll try to have them fixed before we arrive. Thank you, and remember, nobody loves you, or your money, more than we do." During the final approach, the Captain was really having to fight it. After an extremely hard landing, the Flight Attendant said: "Ladies and Gentlemen, welcome to Amarillo. Please remain in your seats with your seat belts fastened while the Captain taxis what's left of our airplane to the gate!" An airline pilot wrote that on this particular flight he had hammered his ship into the runway really hard. 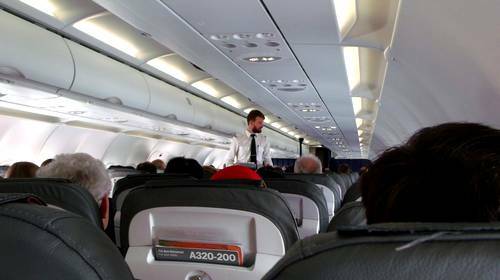 The airline had a policy which required the first officer to stand at the door while the Passengers exited, smile, and give them a "Thanks for flying our airline." He said that, in light of his bad landing, he had a hard time looking the passengers in the eye, thinking that someone would have a smart comment. Finally everyone had gotten off except for a little old lady walking with a cane. She said: "Sir, do you mind if I ask you a question?" "Why, no, Ma'am," said the pilot. "What is it?". The little old lady said, "Did we land, or were we shot down?" After a real crusher of a landing in Phoenix, the attendant came on with: "Ladies and Gentlemen, please remain in your seats until Captain Crash and the Crew have brought the aircraft to a screeching halt against the gate. And, once the tire smoke has cleared and the warning bells are silenced, we'll open the door and you can pick your way through the wreckage to the terminal." "Ladies and gentlemen, if you wish to smoke, the smoking section on this airplane is on the wing and if you can light 'em, you can smoke 'em." A plane was taking off from NY LaGuardia Airport. 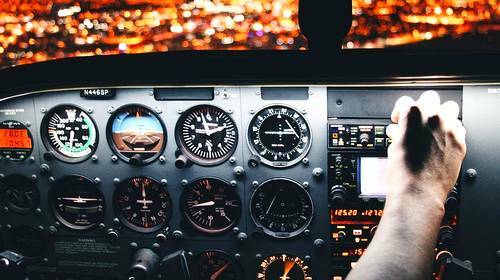 After it reached a comfortable cruising altitude, the Captain made an announcement over the intercom: "Ladies and gentlemen, this is your Captain speaking. Welcome to Flight Number 293, nonstop from New York to Los Angeles. The weather ahead is good and, therefore, we should have a smooth and uneventful flight. Now sit back and relax. OH, MY GOD!" Silence followed, and after a few minutes, the Captain came back on the intercom and said, "Ladies and Gentlemen, I am so sorry if I scared you earlier. While I was talking to you, the Flight Attendant accidentally spilled a cup of hot coffee in my lap. You should see the front of my pants!" . A passenger in Coach yelled: "That's nothing. You should see the back of mine!"